Le Havre Athletic Club (French pronunciation: ​[lə ɑvʁ]; commonly referred to as Le Havre) is a French association football club based in Le Havre, Normandy. The club was founded as an athletics and rugby club in 1872. Le Havre plays in Ligue 2, the second level of French football, and plays its home matches at the Stade Océane. 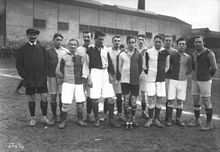 Le Havre made its football debut in France's first-ever championship in 1899 and, on its debut, became the first French club outside Paris to win the league. The club won the league the following season in 1900. Le Havre has yet to win the current first division of French football, Ligue 1, but has participated in the league 24 times; its last stint being during the 2008–09 season. The club's highest honour to date was winning the Coupe de France in 1959. The main rivalries of Le Havre are the "Derby Normand" with SM Caen and an always heated clash with Lens, located in the region of Nord-Pas-de-Calais. It was in 1872 that a group of British residents formed Le Havre Athlétique, which played a hybrid form of football, a cross between rugby and association football, called "combination". Association football began being played on a regular basis in 1894. In 1899, Le Havre became the first club from outside Paris to become French football champions. At the time the championship was organised by the USFSA. After being awarded a win over Iris Club Lillois in the semi-final by walkover, they were awarded the title after also receiving a walkover in the final against Club Français. They would also win the following year, with the final being a "re-match" of the forfeited 1899 final. The club is famous for its notable youth investment program which develops and nurtures young talent, with the vision of using them in the first team if they show enough promise. A vast amount of good young talent has gone on to make an impact at international level including Benjamin Mendy, Ibrahim Ba, Jean-Alain Boumsong, Lassana Diarra, Riyad Mahrez, Steve Mandanda, Vikash Dhorasoo, Paul Pogba and Dimitri Payet. The club was on the receiving end of some high-profile illegal transfers, by which Charles N'Zogbia, Matthias Lepiller and Paul Pogba were signed by other clubs, allegedly without the proper compensation being paid. The first two were arbitrated by FIFA, who ordered Newcastle United and Fiorentina to pay training compensation. (the colors of the) sky and the sea!" As of 5 March 2019. As of 10 October 2018. Note: Flags indicate national team as defined under FIFA eligibility rules. Players may hold more than one non-FIFA nationality. ^ Hernandez, Anthony (15 May 2009). "Avec Louvel," – via Le Monde. ^ "Historical Rugby Milestones – 1870s". The Daily Telegraph. UK. Retrieved 14 May 2006. ^ "France - List of Champions". www.rsssf.com. ^ "Effectif". Le Havre AC Official Site. Retrieved 5 March 2019. ^ "Effectif". hac-foot.com. Retrieved 10 October 2018. ^ "France – Trainers of First and Second Division Clubs on RSSSF". Archived from the original on 31 May 2008. Retrieved 23 July 2007. This page was last edited on 1 April 2019, at 16:12 (UTC).